Earlier this month, we were in Melbourne for Denfair 2017, a three-day design event. Denfair brings together the best brands in the industry to showcase their work and to connect with an audience passionate about beautiful, well-made Australian design. We are based in Sydney’s inner west and have been developing strong relationships with our local community for nearly 7 years. This month we travelled to Denfair to introduce ourselves to Melbourne, to stick our toes in the water of an incredible city renown for its cute cafes, laneway culture and designer eye. Alongside our excitement to meet fellow creatives and see what the design world was up to, we were thrilled to launch our newest additions to our Staple&Co range; the Tatami sofa designed by Tom Fereday, the Cargo Chair and the Cleveland tables designed by Other Works and our new cushion collection West. The day of bump-in was full of anticipation. With red lanyards around our neck and coffee in our veins we unwrapped, placed and replaced our furniture, wiping, dusting and fluffing to make it all look perfect from off the truck. The whole exhibition centre was buzzing with movement, forklifts moving boxes, people pacing on the phone, box cutters sliding through tape, removing wrapping and pushing plastic into boxes, the sound of hammers and drills filling the air, everything a blur of high vis vests and sneakers squeaking on the concrete. Denfair started with a bang, the first day by far our busiest one. At this point only open to trade, we saw lots of familiar faces down from Sydney – interior designers, architects and stylists that we have been working with for years. We had a chance to finally meet some of our Melbourne and Brisbane clients who we only knew by their voice on the phone, and of course, got to know the local designers who have never heard of us. Our Louis sofa was sitting proudly on our stand in a buttery tan leather and dramatic 2400mm length. Louis is often the star of the show in our showroom, and it seemed that Denfair was no exception. Designers of the Louis - Chris and Megan of cm studio also dropped by to say hello to the team (and of course to Louis too). This year, our stand was all about earthy tones and texture. Tan leather, olive felt, navy boucle wool, sage nubuck, misty cotton blends. The Tatami sofa received lots of squeezes on its curved arm, the Charlie armchair in a poodle-like fabric was the cosiest spot on the stand, the nubuck on the Cargo was hard to stop running your hand over. There was incredible variety on show at Denfair. 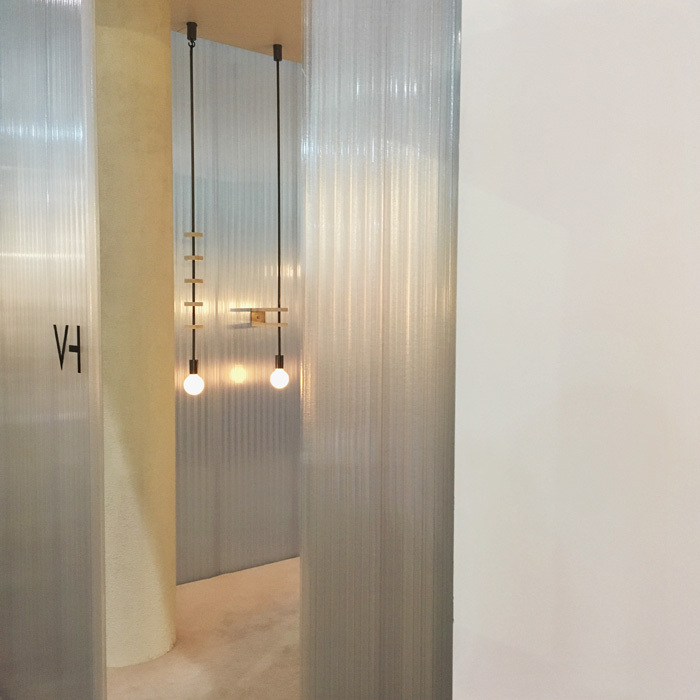 We were stunned by the subtle, minimalistic beauty of the neighbouring Volker Haug stand. Their use of ribbed acetate for the shell and simple striking lighting was poetic and memorable. We also loved the stand by Mud Australia. The soft pastel pink and blue ceramics were expertly positioned on plinths, and the arrangement of plates in a fishscale pattern was whimsical and a gentle moment in the busy hall. In it’s third year, Denfair was bigger than ever. With a reported 9000 people through the show. It was fantastic to engage with an audience who, like us, truly value Australian made and want to support local design. The whole fair had a distinct air of positivity about Australian design, what is happening now and what is happening next. See you next time, Denfair!